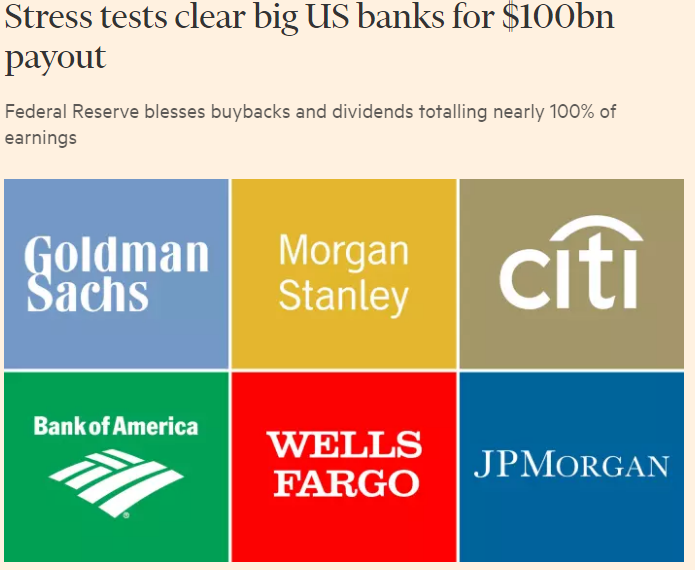 The FT reports today how most of the US banks, who were at the centre of the Global Financial Crisis and continued behaving badly in its wake, have now passed a ‘stress test’. Our analysis shows that it is time to apply a very different test – MI’s test of maximum societal value – for which we have developed the specific measure of Total Stakeholder Value (TSV)*. Using only a narrowly framed test of financial strength, the world’s banking regulators are short-changing society as MI’s latest Report into Banking Governance & Culture now reveals. In this first part of a short series from the 65-page report it is very obvious just how much short-changing is taking place. Here is the first extract from our comprehensive analysis. What would this be worth for the whole global banking sector and how much of it would be passed on to customers and society to repay the debt it still owes for its behaviour? This entry was posted in Maturity Tales and tagged Citi, Fed, JP Morgan Chase, Morgan Stanley, Wells Fargo. Bookmark the permalink.